The FAHS Board of Trustees approved a BYOD procedure document in 2014. This document identifies a flexible BYOD model where the school limits personally owned devices with minimum specifications for internet and network access. Students must take a digital citizenship course and sign an A.U.P. (Acceptable User Policy) before they can register to bring their devices to school. The A.U.P. outlines the acceptable uses of a personal device and staff may limit the use of personal devices if students use them for unrelated or unacceptable activities. To view the procedure document, please click on the following link: BYOD Procedure Document. FAHS students have access to the Microsoft Office 365 range of productivity software for use on up to 5 personal devices. This access includes: Word, Excel, PowerPoint, One Note, as well as 1 TB of online storage on One Drive and a personalised Outlook e-mail account (@my.feildinghigh.school.nz). We recommend that students use their One Drive account to share and save all work with their teachers. Students can sign in to their Office 365 account by clicking on the following link Microsoft Office 365 and signing in with their student number + @my.feildinghigh.school.nz. Once they enter this username they will be redirected and a Windows Security sign in box will appear. Students then enter their student number and password to access Office 365. 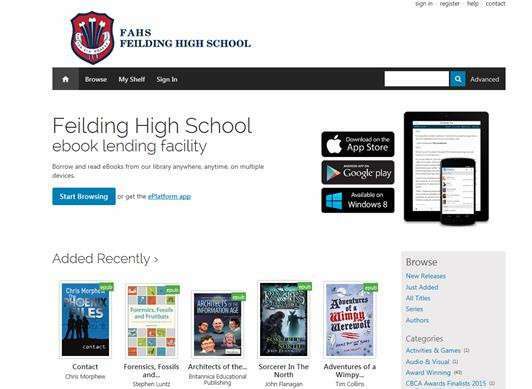 FAHS updated our eBook lending facility to Wheelers in November 2015. This new and improved eBook library can be accessed by students 24/7 to issue eBooks for reading and research purposes. Students can access the eBook library via the website at https://fahs.wheelers.co/ or download the Apple, Android or Windows application (ePlatform by Wheelers) from their respective app store to access the eBook library catalogue. In accordance with our BYOD procedure document, we recommend the use of laptops and tablets for students who wish to bring a device to school. We have a flexible approach to BYOD and do not endorse or advocate any brand nor operating system to students. Students are free to bring any brand or operating system as long as it meets the minimum requirements for devices. We have worked with Harvey Norman and Noel Leeming to offer a range of acceptable BYOD devices at FAHS to include a variety of prices, devices and brands. The BYOD brochures can be accessed by clicking on the links below.